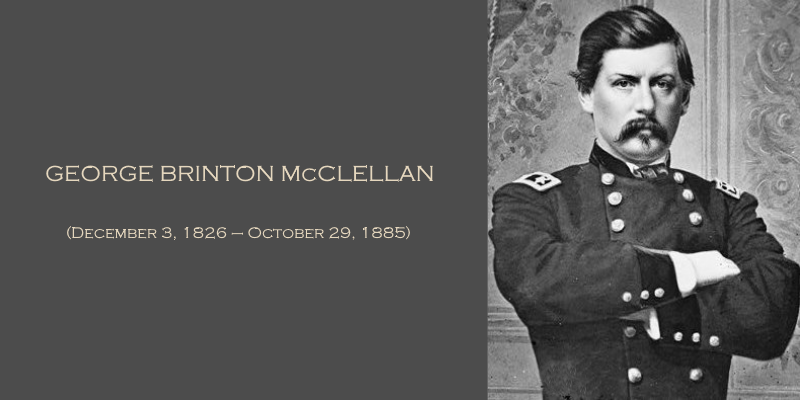 Early in the war, while the north was awaiting deliverance at the hands of General McClellan, there was a lot of puffery written about him. He was called “Little Napoleon” and other flattering sobriquets. He wrote to his wife that, should he desire it, he could be made dictator. 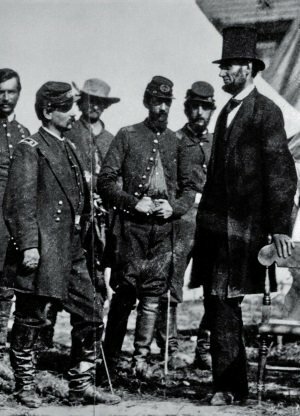 Lincoln and McClellan in the field. In 1864, having twice been removed from his position by Lincoln, Little Mac ran against him for president. Remarkably, he was still on active service, although he had no command. He lost. Though the general had been much loved by the troopers early in the war, Lincoln’s share of the vote with the Army of the Potomac was 70%. Ordered to New Jersey to await orders, he was never given any. At the end of the war, he went abroad for three years. He was later Governor of New Jersey and a possible candidate for Secretary of War under Cleveland, a post he did not receive. 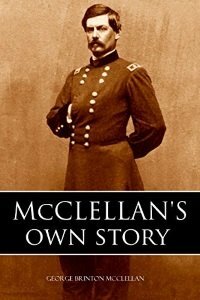 McClellan’s last word on the Civil War was the memoir he was writing when he died of a heart attack at the young age of 58 in 1885. He stridently defended his actions and attitudes during the war. It makes for fascinating reading, especially in light of his importance in the development of the Army of the Potomac. In it, however, his writing betrays what may have been part of the reason for his lack of success as a commander. He found very little wrong in anything he did and continued to place blame on Lincoln and Stanton for interference with his plans. The general’s friend and defender, William Prime (1825–1905), also had a storied and successful career in American life. He was a journalist, art historian, numismatist, attorney, and travel writer. In 1850, he made a trip up Egypt’s Nile River with his wife and friends. He wrote a wonderful account of that trip in Boat Life in Egypt and Nubia. A Princeton graduate, he later helped establish a department of art history there, to which he donated his extensive collection of ceramic art.